A structurally sound, used motorhome is a less expensive alternative for touring and camping. Start by having your mechanic check the engine and make necessary repairs or do it yourself if you have experience with engines. Restoration can be as simple as updating fabrics and carpets or as complex as a complete gut of the motorhome and a rebuild from the chassis up. Remove old carpet and linoleum and check the floors for soft spots or damage. Replace damaged areas and re-carpet the floors in living and sleeping areas. Lay wood laminate or tile in the kitchen and bathroom. Refurbish the kitchen with a built-in combination microwave and convection oven. Strip outdated countertops and install new ones that can handle hot pots and won't scratch, like ceramic. Update the sink with new fixtures and replace inefficient cabinets with storage systems. Add an awning to create an outdoor living space. Install a television set in an upper cabinet so it isn't in danger of falling out, and to leave floor space available for furniture, or hang a flat panel on the wall. Consider carrying a small satellite dish to set up at remote campsites. Test and repair things that are less visible, like grey and black water tanks and the furnace. Flush the water system several times to clear hoses and remove mold and bacteria. Check the exterior for cracks or loose trim and repair them. 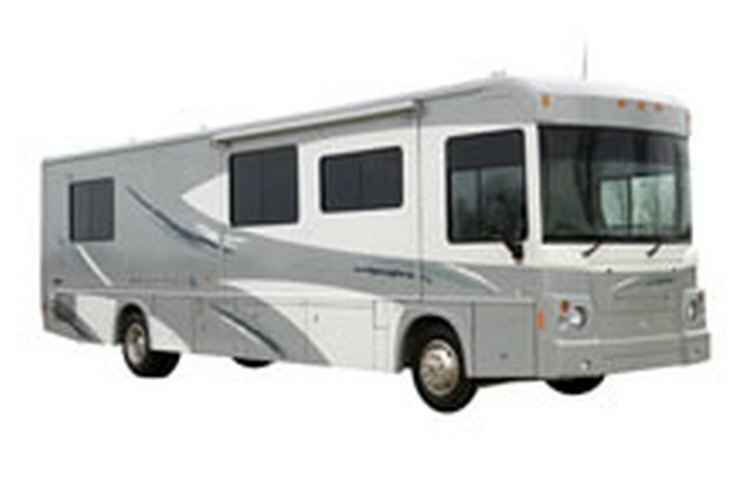 Fill in or repair dents and scratches and repaint the motorhome. Update the driver's area with a comfortable captain's chair, satellite radio and GPS. Install a back-up monitor and camera so that things behind you are visible. Replace small mirrors with larger ones with increased visibility. Give the bathroom a quick update with new wall coverings and countertops. Take down old curtains and blinds and replace them with washable fabric in bright colors. Reupholster furniture in complementary colors. Build overhead storage in the bedroom. Replace the bed with one that either has drawers underneath or one that lifts up to reveal storage. Install a flat panel television over the door.